Padded stacking chair, an original 1950's tubular steel chair with a..
A classic padded stacking chair design from the 1950’s. The chair is ideal for any vintage industrial interior in a restaurant, cafe etc. All chairs are in fantastic condition and are one of our large range of stacking chairs that we currently have for sale. This original stacking chair with its padded seat and back rest is extremely comfortable and offers a real authentic vintage style to any home or business. A real retro funky chair which offers originality with charm. 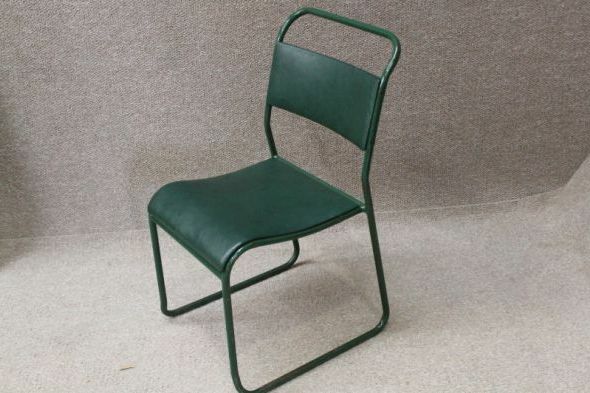 These tubular steel framed stacking chairs became popular from the 1940’s onwards and were available in many different colours, most had a plywood seat which was shaped for comfort, these chairs with their green vinyl padded seat and back support go one step further in comfort. The beauty of the tubular steel frame was that the chairs could be stacked on top of each other which was ideal for interiors with limited storage area. All the stacking chairs are sturdy and robust, there are small signs of use which is only to be expected on chairs which have probably been used hundreds of times. Please note – the price is for one chair but quantities are available.